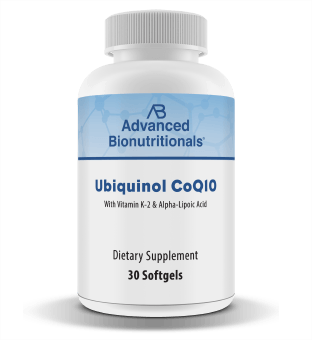 Announcing the new and improved Ubiquinol CoQ10! Now with added vitamin K2 plus twice the ubiquinol to help you achieve higher levels in your bloodstream, more energy and even better antioxidant protection. If you are concerned about your heart health … if you suffer from fatigue, muscle aches, or memory issues… then this is going to be big news for you. You probably know that CoQ10 plays a pivotal role in your health. CoQ10 is the "spark plug" that ignites energy production in every one of your 50 trillion cells. Without CoQ10 … no energy … and no life! CoQ10 is also one of the most powerful antioxidants in your body. It works inside your cell membranes and crosses the blood-brain barrier. It protects your cells, proteins and even your DNA from free-radical damage. It's very difficult for your body to absorb conventional CoQ10. Even if it's packed in liquid gel caps with vitamin E or fat to make it easier to absorb. Only as little as 4% may actually reach your bloodstream. But until now, this conventional CoQ10 was your best (and only) option. I took it myself and prescribed it to my patients for many years. Another problem is that once the CoQ10 enters your body, it has to be converted to a more natural, bio-available form of CoQ10 called Ubiquinol — before you get any of its energy-boosting benefits. That's okay when you're young. But as you get older, you convert less and less. Your total levels of CoQ10 drop. 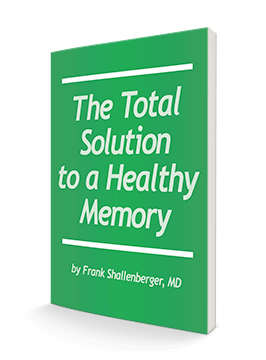 So does your ability to metabolize CoQ10 into the bio-available form your body really needs. Medications can lower your CoQ10 levels, too. It is now common knowledge that cholesterol-lowering statin drugs lower CoQ10 levels in your blood. Here's why. Statins work by suppressing an enzyme in your liver that makes both cholesterol and CoQ10. So it's no surprise that statins can cause a CoQ10 deficiency. In fact, statins can reduce blood levels of CoQ10 by up to 40%. This deficiency can lead to heart, muscle and mental processing. With statin medication, you may not see the side effects for a year or more. If you break open a standard CoQ10 capsule you'll see a familiar orange substance. That's the conventional form of CoQ10 we've known for years. It's called ubiquinone. For the past 40 years, that was the only type of CoQ10 available in supplement form. You had to swallow conventional CoQ10 then wait as your body converted it to the more bio-available form called Ubiquinol. Only then could your body start to use CoQ10's amazing power to charge up your heart, brain, muscles and cells. For years, scientists struggled to find a way to capture and preserve this "bio-identical" form of CoQ10. The trouble was, Ubiquinol is extremely unstable. It "oxidizes" into ordinary CoQ10 seconds after it's exposed to air or sunlight. Highest CoQ10 blood levels ever recorded! "… no concerns about safety or adverse effects …"
Millions of people have taken CoQ10 supplements for over 40 years with no reported toxicity in over a thousand human and clinical trials.3 Respected institutions such as the National Institutes of Health (NIH) say there are few reported side effects of CoQ10. Recent data shows the safety and tolerability of CoQ10 at doses as high as 3,000 mg a day. The safety of Ubiquinol has also been confirmed by recent single-blind, placebo-controlled studies. Ubiquinol was developed by the largest manufacturer of CoQ10, creators of the most thoroughly tested, widely trusted and highest quality bio-identical CoQ10 in the world. They have demonstrated its safety in preclinical toxicity studies and published human clinical studies, and adhere to the strictest manufacturing practices designated by the FDA. Another study showed 300mg of Ubiquinol for 4 weeks caused a "markedly high" serum level of 8.413umol/L - an 11-fold increase over baseline. The highest net increase in blood levels of any research study to date occurred using Ubiquinol at a dose of 600 milligrams daily. Blood levels reached 10.7 umol/L - higher than in any previous study of CoQ10! This shows that you can take smaller doses of Ubiquinol and achieve the same or better results than with standard CoQ10. This is great news for people who can't efficiently convert CoQ10 to Ubiquinol — either due to age or illness. Now, supplementing with ubquinol can restore healthy levels of CoQ10 in your bloodstream and organs faster than anything you've experienced before. So what can higher levels of natural, bioactive CoQ10 in your heart, brain, organs and tissues do for you? Improving your CoQ10 to healthy levels can give you back the youthful energy you had years ago. In one animal study, researchers measured the effect Ubiquinol had on mice and exercise. The mice taking Ubiquinol were able to run continuously 2.5 times longer than mice taking conventional CoQ10. Other studies show that Ubiquinol reduces exercise-related fatigue 90% better than conventional CoQ10. Supplementing with Ubiquinol is the ideal way to restore and sustain your natural, youthful energy. Ubiquinol is also one of the most powerful fat-soluble antioxidants known to science. It has a special advantage that protects your body from damage caused by oxidative stress and free radicals. The advantage comes from having 2 extra electrons compared to the conventional CoQ10 molecule. This makes a huge difference. Ubiquinol donates these 2 extra electrons to unstable free radicals like peroxides-and neutralizes them. And because it's fat-soluble, Ubiquinol can penetrate deep inside your cell membranes, into the very hub of your cells. It protects the mitochondria of your cells and even your DNA. Its potent free radical scavenging extends to brain tissue, where it protects neurons from the ravages of oxidative damage. Ubiquinol also "recharges" other antioxidants in your body, such as vitamins A, C and E.
Plus, since Ubiquinol is up to 8 times more bio-available, it can achieve the same effect with much smaller doses. It can protect neurons from oxidative damage and potentially ward off cognitive decline. Many studies now show that statins interfere with your body's production of coenzyme Q10. And you already know how vital CoQ10 is for cellular energy production and normal heart muscle function. Some doctors, like Dr. Peter Langsjoen, a leading CoQ10 researcher, think that statin-induced CoQ10 depletion has led to an "epidemic" of heart problems in this country. Many studies show substantial decreases in blood and tissue CoQ10 levels after taking statin drugs. That's because statins reduce the activity of HMG-CoA reductase, an enzyme that's involved in both cholesterol and CoQ10 production. This can drastically increase your chances of heart muscle impairment, or abnormalities of your heart's pumping cycle. But there's one simple step you can take to protect yourself. If you have to take a statin, be sure to supplement with CoQ107 — preferably the new, more bio-available form — Ubiquinol. That's the kind you get in Ubiquinol CoQ10. Click here to get the most powerful form of CoQ10 for greater energy … improved cardiovascular health and immune support. When your immune system goes into battle against illnesses, your immune cells need large amounts of energy. Research shows the energy boost from Ubiquinol enhances the activity of key immune functions. Like increasing antibody production and phagocyte activity. These are special immune cells that devour pathogens and other infections. Ubiquinol also has the ability to increase oxygen utilization in your body.8 When your immune system is busy fighting viruses, bacteria and other toxins, this shot of oxygen can give it the extra strength it needs. Limits the effects of aging! Because of its energy-rich, antioxidant ability, there can hardly be a more significant nutrient than Ubiquinol on aging and health. By "old age" — 12 months — the difference was shocking. The control mice could barely move and were unresponsive, due to advanced aging. The mice on conventional CoQ10 were only slightly better. But the mice taking Ubiquinol were alert, responsive and energetic. They had no physical lesions or deformities. Their coat was the glossy type of a healthy young mouse! Remember, these mice were specially bred to get old fast. Yet Ubiquinol dramatically postponed their symptoms of aging. Restores healthy gums: In several double-blind clinical trials, supplementing with CoQ10 significantly improved gum tissue. Even fosters younger-looking skin! Studies show Ubiquinol may protect your skin against damage from harmful UV rays and the effects of aging. YES, I'd like to restore healthy levels of CoQ10 and feel more energetic than I have in years! There's no question that Ubiquinol can make a huge difference. It energizes your heart..
… and wards off the effects of aging. The folks at Advanced Bionutritionals have created something that's truly unique for energy, vitality and a healthy heart. They've combined Ubiquinol with two of my favorite nutrients. You've probably heard that vitamin K2 is important for bone health. And it is. Research shows that K2 helps direct calcium into your bones and teeth. But just as important as where it puts the calcium is where it gets the calcium. You see, it gets it from the linings of your blood vessels. I'm sure you know how much trouble excess calcium can cause in your blood vessels. Well K2 helps remove it. 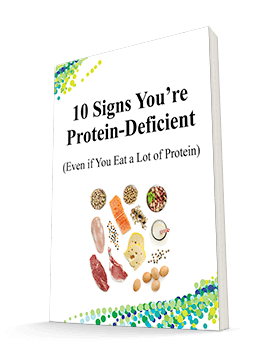 Plus, recent studies show that statin drugs deplete vitamin K2 just like they do coQ10! Vitamin K2 is available in two different supplement forms: MK-4 and MK-7. MK-4 has a very short half-life - only about one hour. So it doesn't stay in your body very long. MK-7 on the other hand has a much longer half-life of three days. So it's much easier to maintain a consistent blood level of K2. How would you like to have enough energy to do all the things you dream of doing? One of my favorite nutrients — alpha lipoic acid — can re-invigorate you and boost your energy level. Studies show alpha lipoic acid can practically reverse aging.13 Researchers tested it against 100 detoxification and antioxidant genes in mice. When given alpha lipoic acid, "their cognitive ability, behavior, and genetic expression are comparable to that of young animals." The animals weren't just living longer, they were living better. How does it do it? Researchers at the Linus Pauling Institute, found that alpha lipoic acid restores levels of glutathione to that of a young animal. Other ingredients: Rice bran oil, gelatin, glycerin, purified water, sunflower lecithin, annatto extract, fumed silica and titanium dioxide. **Q+®, Kaneka Ubiquinol®, and the Quality Seal® are registered trademarks of Kaneka Corp.
You probably already know that glutathione is a critical antioxidant and detoxifier. When glutathione levels decline, you become more susceptible to free radicals and other environmental toxins. Recycles vitamins C and E in your body, boosting their effectiveness. Helps detoxify your body of heavy metals, especially mercury and cadmium. "Kick starts" declining function in cells that were more abundant in youth. Reduces mitochondrial degeneration. Protecting your mitochondria is crucial to good health and high energy levels. The slower they age, the slower you age. Soothes inflammation throughout your body, which helps with many degenerative health conditions. All 3 of these nutrients work together to give you a powerhouse of health benefits! Ubiquinol is far superior to standard CoQ10. I believe you will get better results for even less money in the long run. What's more, with this combination formula, you're getting 3 really powerful nutrients to support energy production, heart and cardiovascular health, improved memory, anti-aging benefits and more. It's a step beyond Ubiquinol. This is the biggest CoQ10 news I've seen in many years. I give Advanced Bionutritionals' Ubiquinol CoQ10 my highest recommendation. If you are taking regular CoQ10 and not getting the improvement you need, Ubiquinol CoQ10 is for you. The average person taking CoQ10 usually takes around 100 to 200 mg per day. But I recommend much more than that. Since Ubiquinol is up to 8 times more bioactive, 100 mg is equivalent to 800 mg of conventional CoQ10. That's a good, powerful dose. This is the only Ubiquinol formula I know that has these two other heart and energy nutrients — alpha-lipoic acid and Vitamin K2 — together in one complete formula. I'm delighted that in these tough economic times, Advanced Bionutritionals has been able to lower the price and make this critical nutrient available to even more people. Remember: with every Advanced Bionutritionals product, you are completely protected by a "Down-to-the-Last-Pill" guarantee. If at any time you're not satisfied with Ubiquinol CoQ10, just return the empty bottle within 90 days of your purchase for a full refund of every penny you paid, including any shipping charges. You only pay return shipping. No questions asked. Advanced Bionutritionals will even refund your money if you've finished the full bottle! It's easy to order. Simply click here to fill out the secure order form. Or call us toll-free at 1-800-791-3395 any time 24 hours a day, seven days a week. To give your body time to feel the full effects, I suggest you take a 3-month supply. You'll receive enough Ubiquinol CoQ10 for 90 days and you'll save more than $3 off the price of each bottle. Better yet, ask for the Six-Month Savings Pack. You'll pay just $24.95 per bottle (that's a $5 savings on each one) and get FREE SHIPPING, too! Imagine how great it will feel to enjoy life with the energy and vitality you had 20 years ago. Imagine how much fun you will have participating in your favorite activities again with friends, family and loved ones … with renewed vigor and enthusiasm. Imagine living without fatigue, shortness of breath, and the heart worries that may have plagued you before. If you are concerned about your heart … if you're suffering from fatigue, lack of energy, or memory issues … this is one supplement you definitely don't want to be without. 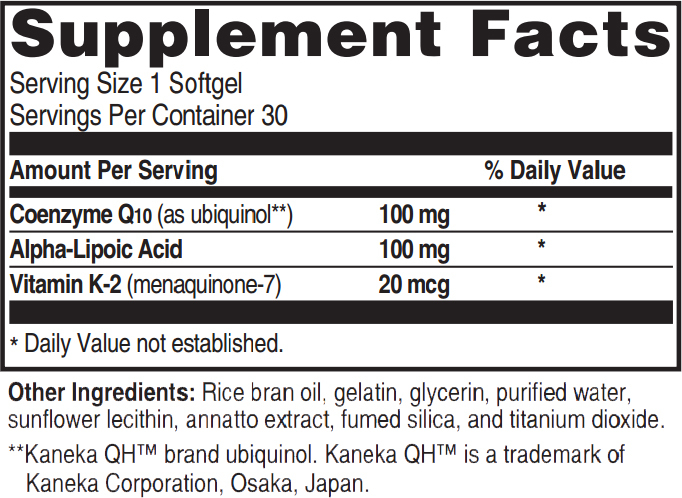 I urge you to order your Ubiquinol CoQ10 today! P.S. Click below or call today to take advantage of the remarkable healing powers of Ubiquinol CoQ10. In just a few short weeks you'll be feeling the difference in new-found energy and stamina … stronger immune system … improved memory and mental clarity … and better cardiovascular support. And you'll be so glad you took action today! Please follow this link to order, or call 800-791-3395 any time 24 hours a day, seven days a week. ACT NOW! Order Your Ubiquinol CoQ10 Today!